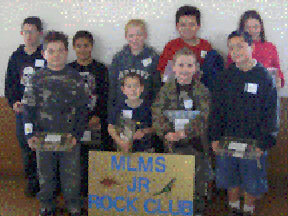 Junior Rockhounds learn about rocks, minerals and fossils, start a rock collection and have fun activities. Our Junior Rockhounds also put an exhibit case in our show with some of their findings from rock collecting trips! See pictures from our meetings! Our Junior Rock Hound Meetings are held at 1:15 before the General Meeting... See the calendar for the next meeting and map! 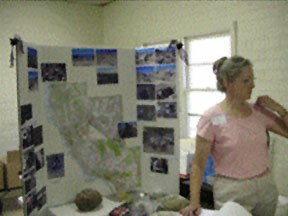 Each meeting will have a short informative session on rocks, minerals and earth science as well as a hands on activity for the children designed to help them earn badges and patches that are similar to the boy and girl scouts programs. 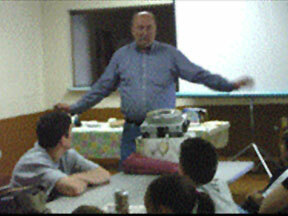 The meetings will be hosted by several club members on a variety of subjects. Meetings will be open to children from second grade through age 18. Additional information will be in the next Ghost Sheet. Please be sure to let your family and friends know about the Junior Rochkhoud Club so that they will have plenty of time to get it on their calendar.